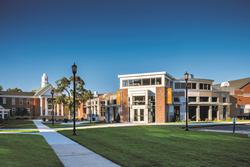 According to the Chronicle of Higher Education, among private, nonprofit doctoral institutions, American International College (AIC) placed fourth among the top 20 colleges and universities in the country with a 95% growth rate. In this competitive and rapidly changing world, we make every effort to help our students compete successfully and are proud to be recognized for our efforts. The Chronicle of Higher Education has named American International College (AIC) one of the fastest growing colleges in the United States for the sixth time. Among private, nonprofit doctoral institutions, AIC placed fourth among the top 20 colleges and universities in the country with a 95% growth rate. AIC nearly doubled its enrollment over a ten year span, 2005-2015. In a categorical comparison to other colleges and universities in Massachusetts, AIC surpassed ninth-rated Worcester Polytechnic Institute as the only other college or university in the Commonwealth that placed in the private, nonprofit doctoral category. Data collected for the Chronicle of Higher Education was based on fall enrollments of full-time and part-time students and included all U.S. degree granting programs with a minimum of a 500 student enrollment in 2005. Institutions are grouped by the 2015 Carnegie Classification of Institutions of Higher Education.